As the sun begins to set over Jerusalem on Friday afternoon, a feeling of impatience falls over the city and an air of hushed excitement falls over our group. We are going to the Western Wall to see the Jews welcome in Shabbat. We enter the Old City through Lion’s Gate. The streets are barely wider than a car, so we press against the wall as cars come through. All the Palestinians are going home for the day, some to homes within the Old City and some to homes outside. The vendor of every shop that we pass is anxiously packing up his merchandise. Everyone is trying to close before the Sabbath at sundown. All the Orthodox Jews pass us quickly on their way to the Wall; some are almost running. No one wants to be late. Contrary to popular belief, the Wall is not actually a remnant of the temple. It is a remnant of the retaining wall built to support the large temple mount where the Herodian temple sat. We arrive, and Wall is already packed with people. The area near the wall is fenced off into two separate sections: men and women. As we enter into the women’s side, everyone is greeting friends and family. We crowd in, and some women are singing and dancing, while others are holding their Hebrew prayer books and rocking back and forth as they pray. One singing group welcomes us in. We don’t know the words, but we clap along and then later we join hands and dance with them (we don’t know what we’re doing, but we try our best to fake it). The whole time, we are careful, like the Jewish women, not to turn our backs toward the sacred Wall. I go to touch the wall itself; it takes about ten minutes of waiting because the crowd is so dense. Hundreds of Jewish women press their faces against it as they pray. Finally it’s my turn; I touch the cold stone and think of all the prayers that have been uttered there. I say a quick prayer of gratitude to be in the Holy Land, then leave the women’s section to go watch the men (walking backward the whole time, of course!). The men are having a very different experience. Their side of the wall is bigger, but much more crowded–there is hardly standing room for everyone. And their celebration is much livelier. The men sing loud songs in Hebrew to welcome in the Sabbath. Then they form circles and begin dancing. And things get even rowdier from there. In the circles, three men link arms and spin around the circle as fast as they can (one frail-looking old man looks as if he’s about fly away!). Other men wave their arms and shake them–I am absolutely serious–like Tevye in “If I Were a Rich Man.” The rest of the men in the circle jump up and down, clap their hands, and sing louder than ever. The rule about not turning your back to the Wall definitely does not apply on the men’s side! As the other girls and I watch from behind the fence, the Jewish men welcome in our guys completely. The old men and the young men, the most Orthodox and our American boys, dance and sing together. This is not a show put on for tourists; they are sincere in their fervor. They are expresssing complete joy in welcoming Shabbat. As I watch them, I feel an overwhelming sense of brotherhood (and a twinge of jealousy). 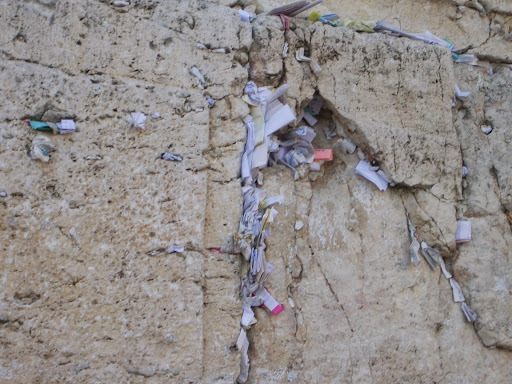 Maybe on other days of the week, the Western Wall is a wailing wall, as it is commonly nicknamed. But on Friday night, it is a place of excitement and celebration. The Jews are welcoming in the Lord’s day with complete joy and reverence–not quiet reverence, but worshipful reverence nonetheless.